This is one of those times where I won’t talk much about my or my kids’ lives. I will, however, talk about others. In the summer of 2008, just three years before my wife, Andrea, passed away, I jumped head first into a series of military stories. In fact, consequences be damned, I embedded with an Air Medical Wing out of Travis Air Force Base that flying into a war zone. My wife was beside herself. I’d done this kind of thing once before, by the way. Over New Year’s in 2002, I flew to Israel to report on a country that deals with terrorism every day. Again, I had no thought to the consequences or damage to my family this would do, I just did it. But let me be perfectly clear here. I was never in any danger. Not really. In Israel there was an armistice between the Palestinians and the Israelis over the New Year. I had even set up stories in Gaza City (which we never did get to shoot – long story) and were set up to safely head in there. But the trip out of Travis . . . that was one of the most amazing experiences of my life and not because of any combat. I saw no combat, never even came close. It was amazing because of the types of people I met through the entire trip. The initial stages of the trip were set to take us overseas and into Baghdad. At the last minute the trip was changed to Bagram Air Field. I felt like I needed to go on this trip because, at the time, no one had told this story. 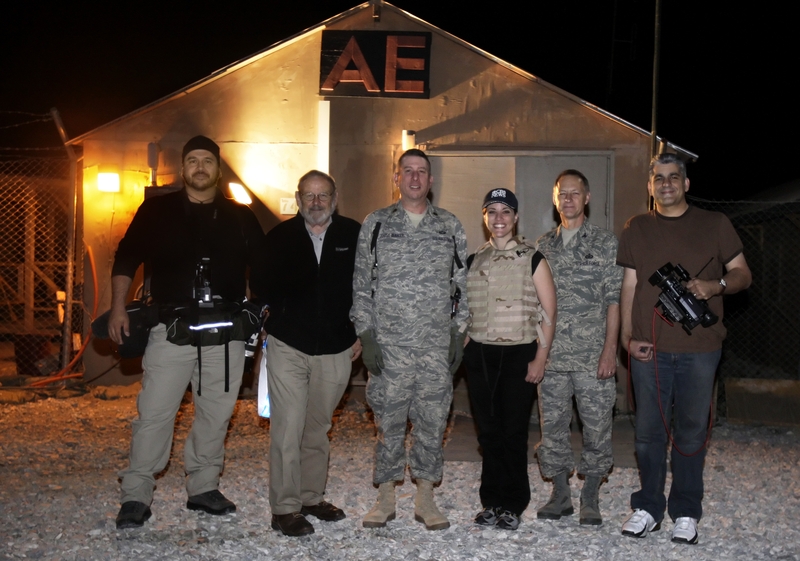 Every week – to this day, I believe – a crew of six Air Force Reservists get on a plane for an exhausting six-day mission into whatever theater is active. In 2008 we had two active military operations going on, one in Iraq, and the one where we were headed, Afghanistan. 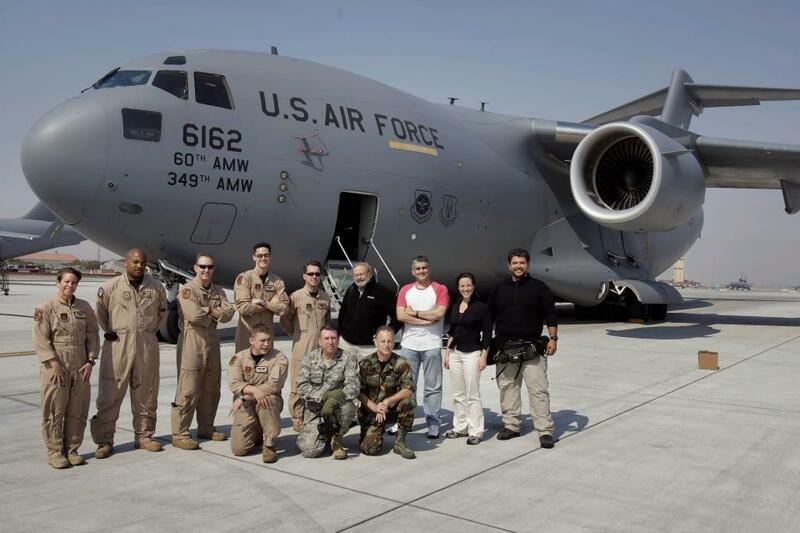 The six-day mission that they fly is to go overseas and pick up wounded soldiers. That’s what these people do. They start at the air base here in the US and get equipment together. We flew in a C-17 and stopped first on the East Coast. Getting off the plane you notice you’re parked adjacent to Air Force 1 and 2 – planes that are reserved for the President and Vice President. They spend one night there in base housing and then, early in the morning, the plane takes off with gear loaded on for Landstuhl, Germany. The US Air Base there houses one of the greatest hospitals the military has in service and all the service men, unless in dire, horrible need, will end up there if wounded. We landed and rather than sleep, the men and women immediately began unloading equipment from the plane for the medical personnel and the base in Germany. We began shooting interviews. I met a man who said if it weren’t for the hospital and the personnel there he wouldn’t have made it. He was humble, he was happy, and he was thankful to the people at the hospital. This man had just been wounded a couple weeks prior, had months of rehab in front of him, and he was calling the people who flew him out of Baghdad heroes. Inside the hospital I met doctors and nurses. One nurse told me how they do whatever they can to help the men and women coming into their hospital because they’re heroes. They fought for their country and were injured in the line of duty. One man lost his legs and was heavily sedated. He woke up maybe a dozen times and each time she had to tell him, all over again, that he’d lost his legs. Each time the soldier had a different reaction and the nurse cried – a lot – that day. When we flew into Bagram the pilots all but did a nosedive, in the dark, no lights on in order to avoid the possibility of insurgents firing at the plane. We landed more comfortably than any flight I’ve had on an airline. The men and women on the base volunteered, like an honor guard, to pull the wounded soldiers off the bus and gently put them onto the plane. The C-17 on which we rode had been converted into a flying hospital, the equivalent of an ICU at each bed. We left the war zone after being on the ground two hours. That’s it. Two hours, on base, never going outside Bagram. I was safe, these men and women had obviously been in combat zones. One man had to have a piece of his skull removed to relieve pressure and the doctors sewed it into his abdominal cavity in order to preserve it so they could place it back on his head. One man told a story of a sergeant he’d met in the US before deployment, a big old farm boy. He joked “when I get hit on the battlefield I want you to carry me off.” When the man was injured…that sergeant was there and literally carried him out of harm’s way. He was taken via blackhawk to Bagram. We were on the plane taking him to Germany. The military credits these missions – the midnight flight into the air base; the quick response and flight back to Germany – as the reason so many men and women have survived this current war. But the amazing thing to me is the fact that, to a person, not a soldier, not a combat veteran, not a nurse, load master, pilot or mechanic would take the title of “hero”. The soldiers called the medics and doctors heroes. The doctors and nurses blushed and refused that saying the men and women risking their lives were heroes. To me, they all are. I was a slouch stumbling around their work getting pictures. They were doing actual work, and it was amazing. As exhausting as the trip was, there’s no doubt it’s more so for the soldiers and airmen who go on this mission. Even more impressive . . . they all say they’re honored when they see they are on this rotation. So even though it’s been five years . . . I still send along my honor and pleasure for having been able to tell their story. It’s Memorial Day, and these are the heroes we should all honor today.